I have a long, long list of sandwiches to try from Vegan Sandwiches Save the Day, and I'm going to slowly make my way down that list of yummy delights. This week I finally made the High Protein Wraps, which caught my eye the very first time I opened that book. All together, the various elements came together to create an explosion of flavor. This baby really packs a punch! 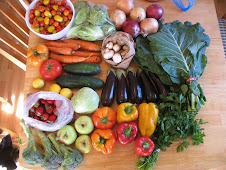 I especially loved the crisp, clean crunch of the cukes and bell peppers, along with the rich tapenade. 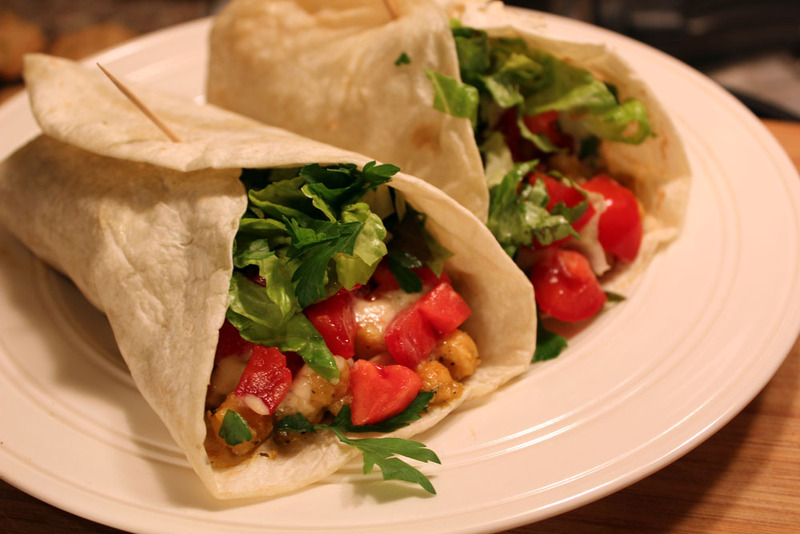 While I have a yummy pack of tortillas in the fridge, I decided to also make the Chickpea Shawarma wraps - even though the recipe called for pita breads, I figured this would be an okay sub. When I told Mr. VE&T what we were having for dinner, he said "huh. I don't really like chickpeas" (he often makes this claim). However, as soon as he took his first bite, he said "Oh wow! Is there more?!" So, that's pretty great. The chickpeas are roasted with some lovely spices to give them a lot of a flavor and a little bite, plus the fresh tomatoes & lettuce and some amazing tahini sauce. The whole concoction is a total win. We both loved these! Both of these delicious wraps, the High Protein Wraps and the Chickpea Shawarma are recipes I will definitely make again - but first I have to make my way through some more of my long list of sandwiches recipes to try for the first time! This book just keeps on givin'! 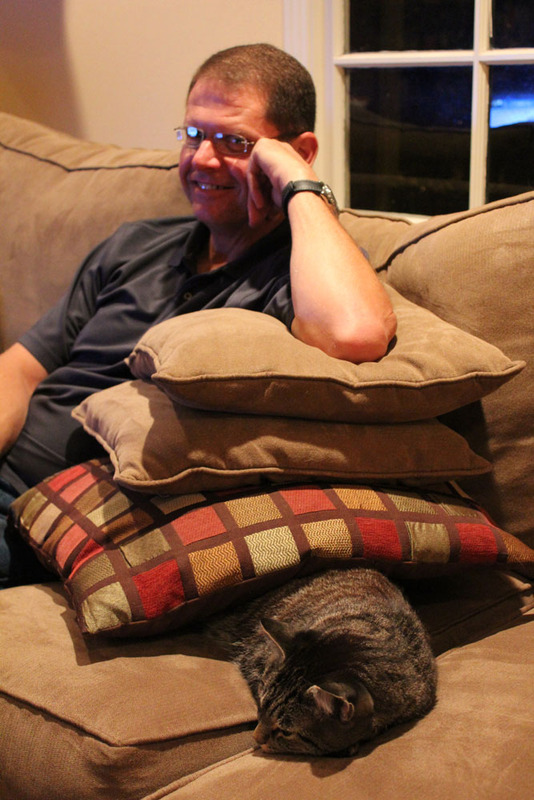 Bonus Picture of Yummers Potatoes and Mr. VE&T snuggling together. Yummers didn't seem to mind having all those pillows on top of him at all! That is a GREAT photo of Musty and Yummers! You should send a print to Marilyn. Mmm, this does look so tasty! The chickpea shawarma is first on my to-make list from VSSTD. I bought all of the ingredients the last time I was at the grocery store, except that they didn't have any plain soy yogurt in stock. So I have to put it off until I make it to the store again. I noticed that there's curry powder in the spice mix, which I thought was a surprising addition for a Mediterranean recipe. Did it have more of an Indian bent that way? Or did you not really notice with everything else going on in the wrap? I love that book so much, but haven't made those two recipes yet, thanks for the reminder! 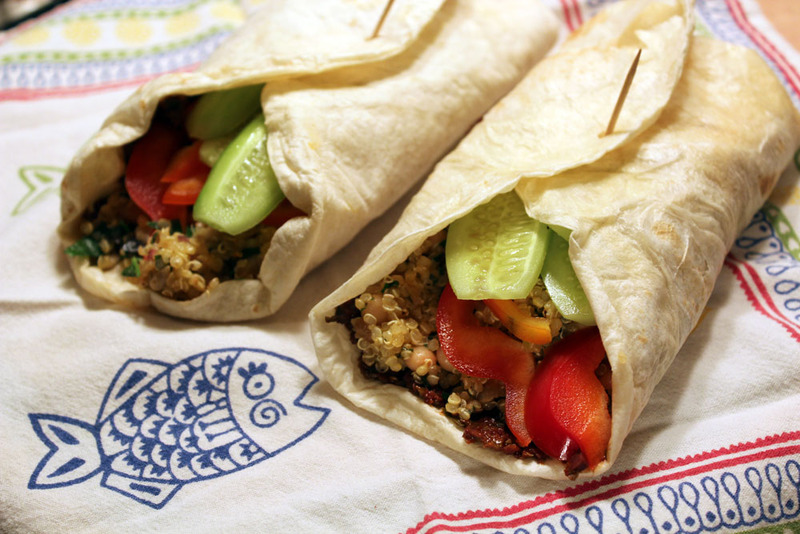 I love the chickpea shawarma! And I love your substitution. Over here shawarma is always served as a wrap. And I have to try the high protein wraps. They look so delicious. 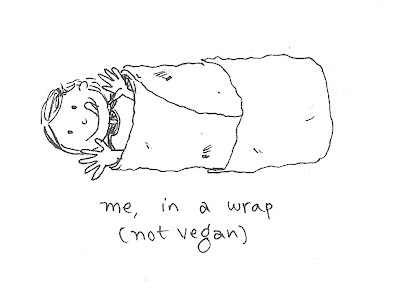 You in a wrap is vegan unless someone tries to eat you! Both wraps look great, I asked for this book for Christmas and hope Santa comes through! That book is the best, isn't it? You and Kittee are Wrap Artists. Oooh that looks so good! It's so funny when totally different recipes catch different peoples eyes, I'd totally skipped past that one but it looks great! 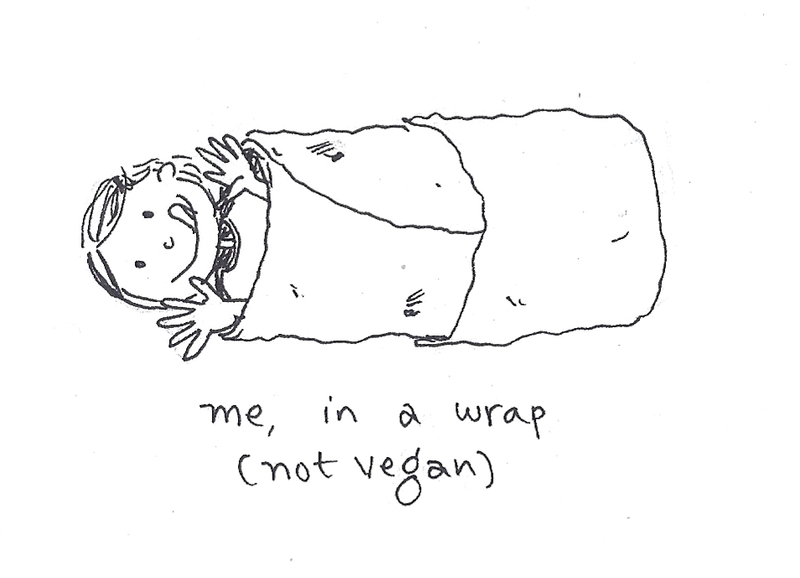 I love your drawing too, it reminds me of a silly thing I do when I get cold where I wrap myself up like a sausage roll in a blanket and then a duvet to warm up!! Vanilla Gluten-free Vegan Pizzelles Made with Teff Flour!